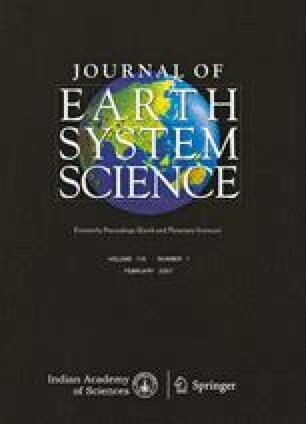 The major element relationships in ferromanganese (Fe-Mn) crusts from Afanasiy-Nikitin seamount (ANS), eastern equatorial Indian Ocean, appear to be atypical. High positive correlations (r = 0.99) between Mn/Co and Fe/Co ratios, and lack of correlation of those ratios with Co, Ce, and Ce/Co, indicate that the ANS Fe-Mn crusts are distinct from Pacific seamount Fe-Mn crusts, and reflect region-specific chemical characteristics. The platinum group elements (PGE: Ir, Ru, Rh, Pt, and Pd) and Au in ANS Fe-Mn crusts are derived from seawater and are mainly of terrestrial origin, with a minor cosmogenic component. The Ru/Rh (0.5–2) and Pt/Ru ratios (7–28) are closely comparable to ratios in continental basalts, whereas Pd/Ir ratios exhibit values (<2) similar to CI-chondrite (∼1). The chondrite-normalized PGE patterns are similar to those of igneous rocks, except that Pd is relatively depleted. The water depth of Fe-Mn crust formation appears to have a first-order control on both major element and PGE enrichments. These relationships are defined statistically by significant (r > 0.75) correlations between water depth and Mn/Co, Fe/Co, Ce/Co, Co, and the PGEs. Fractionation of the PGE-Au from seawater during colloidal precipitation of the major-oxide phases is indicated by well-defined linear positive correlations (r > 0.8) of Co and Ce with Ir, Ru, Rh, and Pt; Au/Co with Mn/Co; and by weak or no correlations of Pd with water depth, Co-normalized major-element ratios, and with the other PGE (r < 0.5). The strong enrichment of Pt (up to 1 ppm) relative to the other PGE and its positive correlations with Ce and Co demonstrate a common link for the high concentrations of all three elements, which likely involves an oxidation reaction on the Mn-oxide and Fe-oxyhydroxide surfaces. The documented fractionation of PGE-Au and their positive association with redox sensitive Co and Ce may have applications in reconstructing past-ocean redox conditions and water masses.